The edge of the solar system is a turbulent place, filled with a roiling sea of huge magnetic bubbles, new research suggests. The find, made with the help of observations from NASA's venerable Voyager probes, shakes up prevailing views of the solar system's outer reaches. And it shows that this region, once thought to be a relatively firm shield against interstellar particles such as galactic cosmic rays, is actually more of a porous membrane. "We will have to change our view of how the sun interacts with particles, fields and gases from other stars," Arik Posner, a Voyager program scientist at NASA Headquarters in Washington, D.C., told reporters today (June 9). Our sun's sphere of influence, composed of solar plasma and solar magnetic fields, is called the heliosphere. This gigantic structure is about three times wider than the orbit of Pluto. At the edge of the heliosphere lies the heliosheath, a boundary region between the solar system and interstellar space. Specifically, the probes measured abrupt changes in the flow of particles, such as electrons, from one patch of space to another. "What really struck us were the sudden differences between what Voyager 1 was seeing and what Voyager 2 was seeing," said study co-author James Drake of the University of Maryland. "We had to explain, well, why is that?" The best explanation, according to subsequent computer models, is that the probes are flying through a frothy field of magnetic bubbles. These bubbles act as particle traps. So particle readings increase while the spacecraft are inside one, then drop when they exit. These bubbles form as a result of the interaction between the sun's rotation and its magnetic field. As the sun spins, its magnetic field churns and twists out in the heliosheath. The folded field bunches up on itself, causing lines of magnetic force to crisscross and reconnect, forming the sea of bubbles. "This entire thing is bubbly, just like the most bubbly parts of your Jacuzzi," Drake said. He added that an observer flying aboard one of the Voyagers would not be able to see the bubbles, because the gas in the area is too diffuse. Researchers are confident that this interpretation best fits the Voyager data, though they'd love some more information from newer, more advanced spacecraft as well. So the team is pushing for new missions to further explore this enigmatic region. "We are pretty confident of this scenario," said study lead author Merav Opher of Boston University. But, she added, "we need more sensitive instruments with a better suite to really uncover what's happening. We are just scraping the surface." The researchers report their findings in the June 9 issue of the Astrophysical Journal. 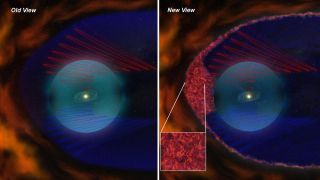 Astronomers had imagined that a smooth, laminar heliosheath acted as a pretty stout shield around the solar system, keeping out many fast-moving particles known as galactic cosmic rays. However, the sea of bubbles likely acts more like a membrane than a shield, researchers said, potentially letting some of these particles zip through into the inner solar system. But scientists don't fully understand how the membrane works and just what is able to pass through it. The bubbles may trap cosmic rays for a while, forcing them to bounce around like pinballs before they finally escape. Figuring out which one of these scenarios is accurate could have a huge bearing on our understanding of the interstellar space environment. If the bubbles are leaky like a sieve, for example, it implies that there may not be as many galactic cosmic rays out there as researchers had thought. This is just one question of many that astronomers will be tackling now, thanks to the new results. "We are still trying to wrap our minds around the implications of these findings," Drake said. Voyager 1 is now about 11 billion miles (17.7 billion kilometers) from Earth, while Voyager 2 is about 9 billion miles (14.5 billion km) away. Voyager 1 is the most far-flung human-made object in the universe.